Lots of tyres are described as Ultra high perfomance but not many live up to the name when put through the testing. The Dunlop Grandtrek PT9000 however does. Designed for high end and perfomance SUV's and to cater for a growing class of luxury 4x4 vehicles. 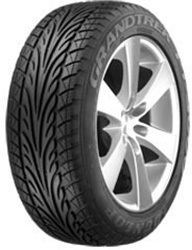 The directional tread pattern and introduction of a silica compound into the tyre ensure maximum grip in all condtions with water and mud dispersed as fast as possible. Designed in a range a of sizes, with a host of low profile editions.